But when St Paul’s Vinnies performed for the Richmond senior citizens, a woman presented Philippa three large bags of peggy squares she wanted to donate to the project. 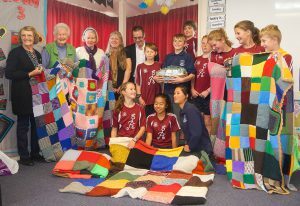 That same week another woman offered to sew up the blankets for the St Peter Chanel Vinnies. ‘Our project went from not having enough peggy squares to make one blanket, to ending up with at least six peggy-square blankets to donate to the Night Shelter’, said Phillippa. The Vinnies also held a ‘Fair Trade’ drinking-chocolate fundraiser in the school community to raise money for toiletries for the Night Shelter. 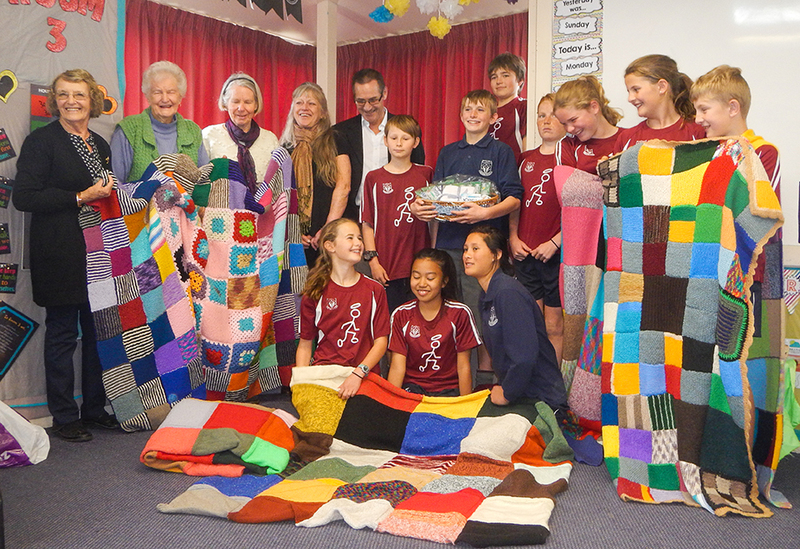 In September, the St Peter Chanel Vinnies and parishioners presented the blankets and toiletries to Mike James and Shelley Alekna from the Motueka Night Shelter. The presentation reflected the biblical story of ‘The Loaves and the Fishes’, showing that God is able to multiply the efforts of people so in turn we can be a blessing to others.